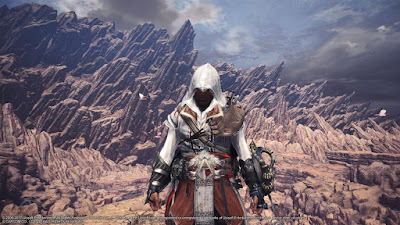 Monster Hunter World New Update Assassin's Creed Crossover. Monster Hunter World introduces Assassin Creed Crossover from a other franchise, this time bringing characters and costumes of Assassin's Creed Series. You can get one of the two signature looks straight out of Assassin's guild wardrobe, as long as you have the chops to take down some monsters first. 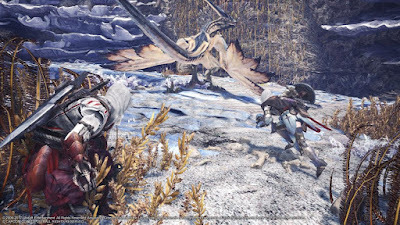 A new event quest SDF: Silent, Deadly and Fierce drops you into an battle arena against some monsters: Odogoron and Deviljho together, followed by Lunastra. Taking down all three will grant you a senu's feather item, Which Assassin's Creed fans will recognize as a reference to Bayek's eagle from Assassin's Creed Origins.An Assassin hood gives you a speed boost to running, climbing and croaching and deals extra damage if you attack from stealth. This is an event quest, so you will have a limited time to take part and earn your rewards.